We’ve fully re-stocked on the entire range ofAi? ?Hayabusa Tokushu Series Gloves. TheAi? ?Tokushu 16oz.Plus Gloves! Designed specifically for athletes with larger hands, or for those who prefer to use thicker hand wraps. Check out the new additionAi??theAi? ?Tokushu SeriesAi? ?on our site, now available to buy! This entry was posted in News and tagged Hayabusa, MMA, Tokushu Gloves on 3.05.2013 by . The ever popularAi? 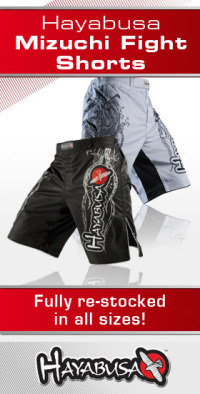 ?Hayabusa Mizuchi Fight ShortsAi? ?are fully restocked in both Black and White in all sizes. This entry was posted in News and tagged Hayabusa, Hayabusa Mizuchi Shorts, MMA on 16.04.2013 by . Once again, we’re proud to announce that we’re amongst the first anywhere in the world to bring you the latest gear from Hayabusa Fightwear. The all newAi? ?GSP Limited Edition 16oz GlovesAi? ?from Hayabusa are now available to buy on a pre-order basis from our site. These exciting new gloves are to be released on a limited edition basis, so once they’re gone they’re gone! To add to the prestige of these top of the range gloves, each pair will come with it’s own collectors box too. Take a look at theAi? ?GSP Limited Edition 16oz GlovesAi? ?on our site for images and more information. We are expecting to take stock of these gloves in early May this year. As soon we do take stock, we will work through any pre-orders as a priority. Once your order is placed we will contact you by email when we have further confirmation on the expected delivery date for your order. This entry was posted in News and tagged Hayabusa, Hayabusa GSP Limited Edition 16oz Gloves, MMA on 15.04.2013 by . 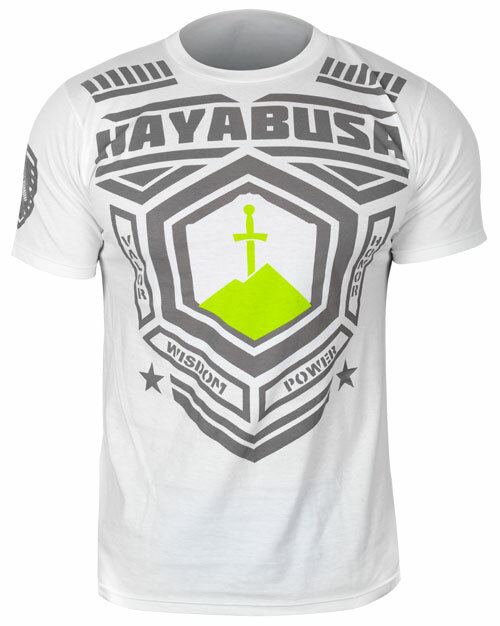 As the Official European Distributor for Hayabusa, we now have the full range of Hayabusa Spring 2013 T-Shirts in stock. With three different styles, each in three varying colours, there’s pleny of choice available in this bold, colourful new range. 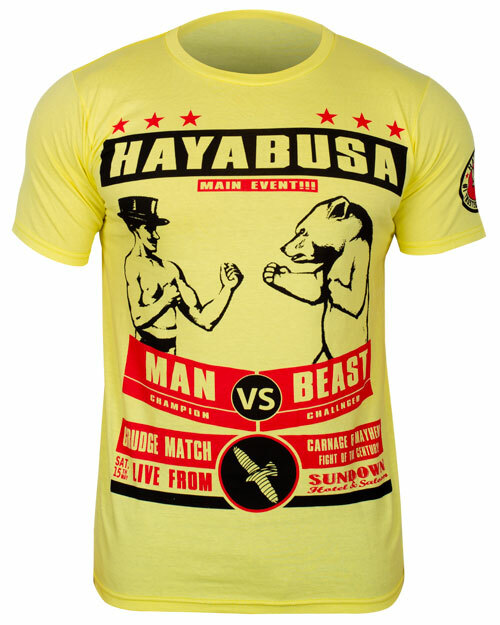 The Hayabusa Gentleman vs Beast T-Shirt is available inAi??Yellow,Ai??WhiteAi??&Ai??GreenAi??colours. The Hayabusa Brotherhhod T-Shirt is available inAi??White,Ai??BlackAi??&Ai??BrownAi??colours. The Hayabusa Olympus T-Shirt is available inAi??Blue,Ai??WhiteAi??&Ai??BlackAi??colours. 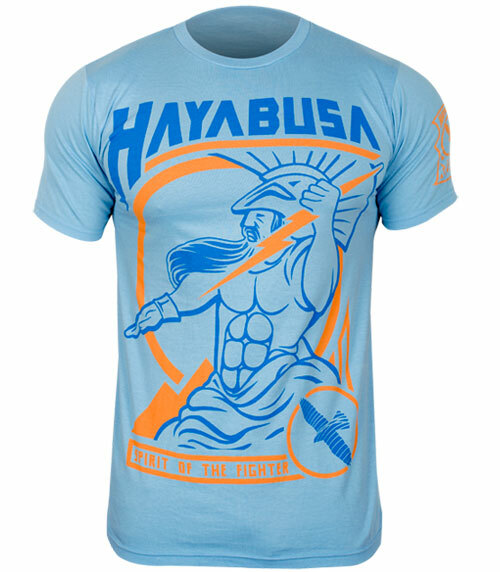 This entry was posted in News and tagged Hayabusa, Hayabusa T-Shirts, MMA, New Hayabusa T-Shirts, T-Shirts on 20.03.2013 by . We have expanded our Hayabusa range ofAi? ?Brazilian Jiu Jitsu Gis, otherwise known as a competition kimono – made from single-weave fabric with a hygienic rubber lapel to improve lightness and provide faster drying. We have the largest selection of Brazilian Jiu-Jitsu Gi (or competition kimonos) in the UK, so check our our latest BJJ Gis! This entry was posted in News and tagged BJJ Gi's, Brazilian Jiu Jitsu Gis, Hayabusa, Hayabusa Gi's, MMA on 15.03.2013 by . Coming soon to MMA Fightwear, the Black Hayabusa Mizuchi Gi. The black version of this gi with its gold embroidered pattern will be a limited edition model, and will have all of the same features as the current white Hayabusa Mizuchi Gi. As an Official European Distributor for Hayabusa, we will be the first to stock and sell this new gi anywhere in the UK and Europe! 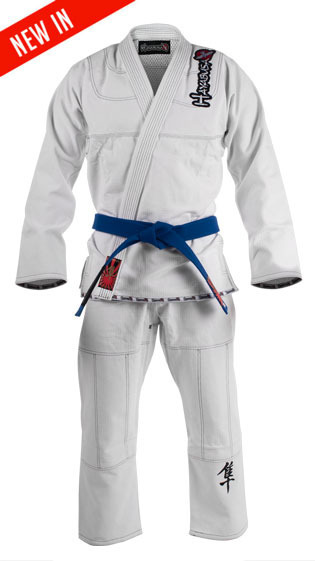 Subscribe to our newsletter to keep up to date with the release date of this stunning new gi from Hayabusa! This entry was posted in News and tagged Hayabusa, Hayabusa Mizuchi Gi on 4.10.2012 by . As an Official European Distributor for Hayabusa, we will be the first in the UK & Europe to stock the new limited edition Hayabusa GSP Rising Sun Gi. Coming soon to MMA Fightwear, this gi has been created by Hayabusa in collaboration with Georges St. Pierre himself. Featuring a “rising sun” inspired design and being constructed from a wicked bamboo material, this gi will combine a unique style with comfort and practicality. The wicked bamboo material will enable the gi to remove sweat from your body as well as being extremely comfortable to wear during training. As with the the current range of Hayabusa Jiu Jitsu Gi’s, the GSP Rising Sun Gi will come with it’s own bag, designed in the same style of the gi itself. We will have more news on this within the coming weeks, so make sure that you’re signed to up to receive our free email newsletter to be amongst the first to know about the pending release date. This entry was posted in News and tagged GSP, GSP Rising Sun Jiu Jitsu, Hayabusa, Hayabusa GSP Gi on 4.10.2012 by . As the Official European Distributor for we are proud to announce that we will soon be stocking the new Hayabusa Ikusa Series. In terms of price, the Ikusa will be positioned as a ‘mid level’ offering, being more expensive than the current original Hayabusa range of head guard, gloves, shin guards etcai??i?? but lower in price than the Kanpeki and new Tokushu Series. Check out our Facebook Page for the Ikusa Series photo album for pcitures of this great new range. *(to be available in two colour variations – see images below). Firm arrival dates are still to be confirmed, but we are hoping to have the full range in to stock by the end of this month. Sign up to our regular Newsletter below to make sure you don’t miss out on the arrival date and to keep up to date with all of other product updates and offers. Subscribe to our newsletter to keep up to date with the release date of this great new range! This entry was posted in News and tagged Hayabusa, Hayabusa Ikusa Series, Ikusa Series on 2.10.2012 by . The popularAi? ?“Alistair Overeem Signature Fight Shorts”Ai??fromAi??HayabusaAi? ?are now back in stock in all sizes in both theAi??BlackAi??andAi??WhiteAi??colours. These shorts sell out fast, so if you’ve been holding out to get a pair in your size, you’d better be quick about! This entry was posted in News and tagged Fight Shorts, Hayabusa, Hayabusa Shorts, Overeem on 27.09.2012 by . Hayabusa, The World Leader In Combat Equipment, Announced It Has Signed A Multi-Year Deal With Georges St-Pierre. HayabusaAi? ?has a long history of working with elite MMA fighters and has just partnered withWelterweight Champion Georges ai???Rushai??i?? St-Pierre. St-Pierre is a consummate professional and an excellent role model for aspiring Mixed Martial Artists.Ai??HayabusaAi? ?feels St-Pierre compliments the brand very well, ai?? ?Georges brings dignity, professionalism, honor and respect to the sport of MMA and we are excited to have him as the newest member of theHayabusaAi??team.ai??? St-Pierre is a Canadian professional mixed martial artist and world champion who holds black belts in both Kyokushin karate and Brazilian Jiu Jitsu and has become one of the most dominant wrestlers in MMA. St-Pierre is dedicated to being the best in the world and this new partnership withAi??HayabusaAi? ?is a perfect fit. ai?? ?I give everything I have when I train, 100% and nothing less. I need equipment that can keep up with me and I know that is Hayabusa. I am proud to be representingAi??HayabusaAi? ?and what they stand for,ai??? said Georges St-Pierre.St-Pierre is a multi dimensional fighter with huge crossover appeal. Ai??ai?? ?Georges is more than a fighter. Ai? ?He is a martial artist and a world class athlete. With our full range of combat equipment, we are able to meet all his training needs,ai???Ai??HayabusaAi??stated. ai???AtAi? ?Hayabusa, we look for long term partnerships that are mutually beneficial. Georges is the complete package and will make an excellent ambassador for theAi??HayabusaAi??brand.ai??? 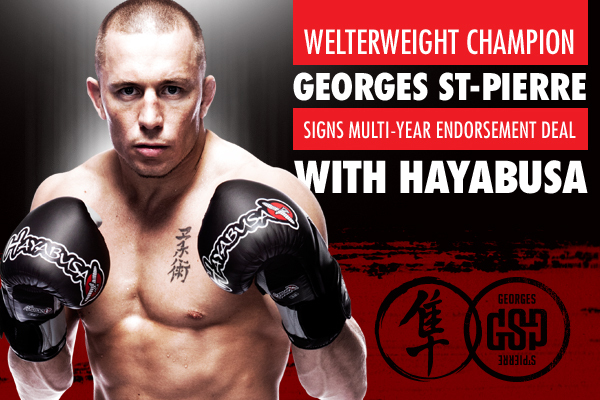 Hayabusa is the industry leader in combat equipment and is proud to welcome Georges St-Pierre to the team. This entry was posted in News and tagged George St-Pierre, GSP, Hayabusa on 8.03.2012 by .